Pledge your love to one another in the stunning elegance of our 2,821-square-foot ballroom at the Country Inn & Suites, Manipal. Our flexible event space accommodates up to 300 guests and provides plenty of audiovisual options. If you aren’t sure how to start planning, our expert wedding advisers are available to give you a facility tour and talk you through the process. We can help you plan your big day down to the last detail. Our expert team of wedding planning professionals is on hand to ensure every personalized detail is executed beautifully. From reserving the dates and working on a theme to arranging the place settings on the table, leave it all to us. 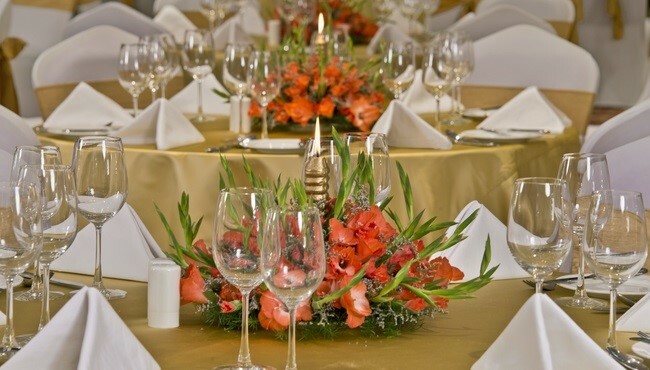 Our catering services allow you to treat your guests to a meal they will cherish long after your event has ended. Our wedding specialists and expert chefs work with you to create a customised menu that reflects your taste. Choose from cuisines like Indian, Italian, Chinese, Thai and more. We also offer interactive buffets with live cooking, where guests can choose dishes based on their individual dietary requirements. Options include a chaat bar, Italian ravioli, Asian dim sum, Thai curry station and Tawa taka tak.